Thomas Hutchison is president, Hutchison Tool Sales Co., Bensenville, IL; 630/766-2585, www.hutchisontool.com . 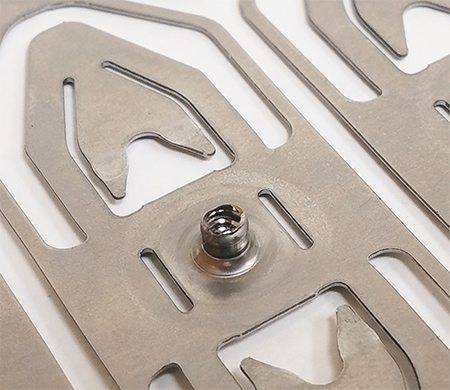 In-die tapping units satisfy high-volume production-stamping requirements, saving metalformers a considerable amount of production time and money by eliminating costly secondary tapping operations. 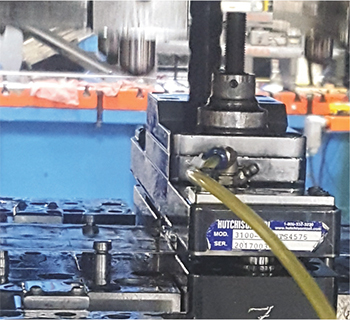 Stampers have employed in-die tapping units to satisfy high-volume production requirements for more than 40 years, saving millions of dollars of manufacturing costs by eliminating costly secondary tapping operations. Like most metalforming equipment, in-die tapping technology has evolved, and stampers now have choices. This article highlights numerous considerations and questions to ask when selecting the optimum in-die tapping unit—mechanical- or servo-driven—based on a particular application and plant operation. 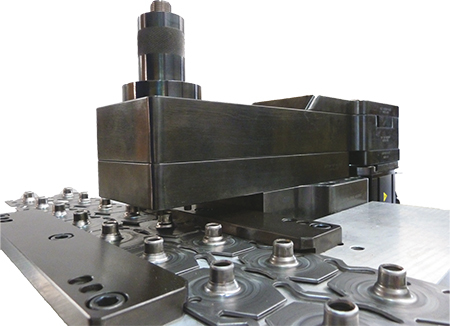 Naturally, mechanical tapping units have evolved the most over time, as much of the tool and die/metal-stamping industry operates on mechanical equipment. The 40-yr. history of mechanical in-die tapping has fostered innovation and led to the development of numerous options, along with well-documented historical data on operational speed (strokes/min. and press-stroke requirements). Also, most die-maintenance and setup technicians, as well as press operators, are qualified to maintain mechanical tapping units. Suppliers of mechanical tapping units design them to run at specific press strokes with a specific gear ratio for tap travel, with a well-defined maximum stroke rate. In most cases this situation suffices, as specific jobs usually are designed to run in specific presses due to press-bed length, press tonnage, etc. Should a die need to run in a secondary press with a press stroke other than what is recommended for the tapping unit, the stamper must make some accommodations. Most tapping units allow some leeway in stroke, perhaps a few inches. However, when stroke varies more than this, significant changes to the tooling will be required to enable proper operation of the tapping unit. Therefore, we recommend mechanical tapping units in applications where the stamper can run the tooling in the same press, run after run, or in multiple presses with similar press strokes. Most mechanical tapping units allow some leeway in stroke, perhaps a few inches. However, when stroke varies more than this, significant changes to the tooling will be required to enable proper operation of the tapping unit. Another key factor when deciding to use mechanical tapping units: press stroke rate. To ensure successful tapping operations, metalformers must consider the gear ratio of the tapping unit, as well as workpiece-material type and sheet thickness. While production speed is well-defined, the tapping operation rarely will limit stroke rate. For example, tapping an M6 x 1.0 thread in steel can run at a press speed to 60 strokes/min.—typically faster than many forming operations would allow. In these cases, mechanical tapping units often prove the most economical choice. Just as servo technology has found its way into presses, feeds and transfer systems, it also has found its way into in-die tapping units. Servo technology adds a level of control not available with mechanical units. The question, though, is whether the extra level of control with servo-based units warrants the higher cost and technical expertise required. 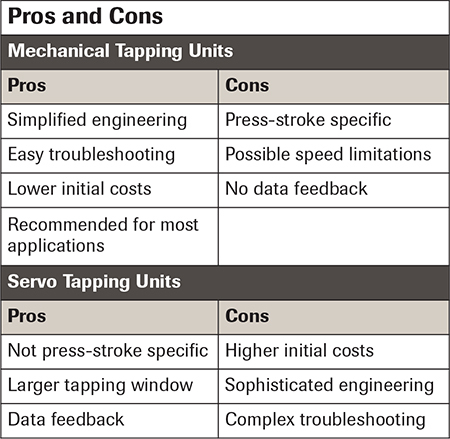 Servo tapping units offer several advantages over mechanical. The use of servo motors in place of mechanical cam drivers enables the use of servo tapping units with any press stroke length, and in a variety of presses, provided that they include an encoder to feed information back to the control panel. Servo tapping units allow for tapping forward at any time in the stroke, even as the press reverses back to top dead center. This allows for a larger window for tapping than with mechanical units, which translates into higher production speeds. Servo tapping units also allow for a larger tapping window when compared to mechanical units. With mechanical units, the tap indexes forward as the press ram moves toward the bottom of the stroke, and reverses the tap as the ram moves from bottom dead center (BDC) stroke back up to top dead center (TDC). Servo units, on the other hand, allow for tapping forward at any time in the stroke, even as the press reverses back to TDC. This allows for a larger tapping window, which translates into higher production speeds in strokes/min., since the tap can retract from the strip at a faster rate than the controlled rpm while tapping occurs. With a mechanical tapping unit, the tap does not retract and allow the strip to feed until a specified number of tapping turns have been completed; with a servo tapping unit, strip feed occurs after a set amount of time, regardless of the number of tap turns. Finally, servo control allows the capture of processing data, which can support preventive-maintenance and product-quality programs. For example, the stamper can prescribe torque parameters and direct the press to shut down should torque vary outside those parameters. If torque climbs above the recommended setting, the tap likely has dulled and needs replacing. Conversely, too little torque could indicate a broken tap. See also: Hutchison Tool Sales Co.